This article contains the stats, strategy, and guide for Berserker - Lancelot. WE WILL UPDATE THIS AS SOON AS THE GAME COMES OUT. Lancelot can patch up his average ATK through his Critical Star boosting Skills and his Noble Phantasm. He is considered as one of the recommended 4 Star Berserker Class servants whose NP deals AoE. Focus on enhancing the Skill Protection of the Faeries to maximize Critical Star absorption to eventually rack up damage. When paired with Atalante, have them rotate between collecting Critical Stars and executing their NP. Mash Kyrielight is another recommended servant due to her buff Skills namely Wall of Fuming Chalk and Wall of Brittle Snowflakes to safeguard Lancelot (Berserker)’s poor Defense. Lancelot is best equipped with Angel’s Song to promote the damage output of his NP. Verdant Sound of Destruction is equally as helpful given that Lancelot bears 3 Buster Command Cards making it more likely for him to deal powerful damage. 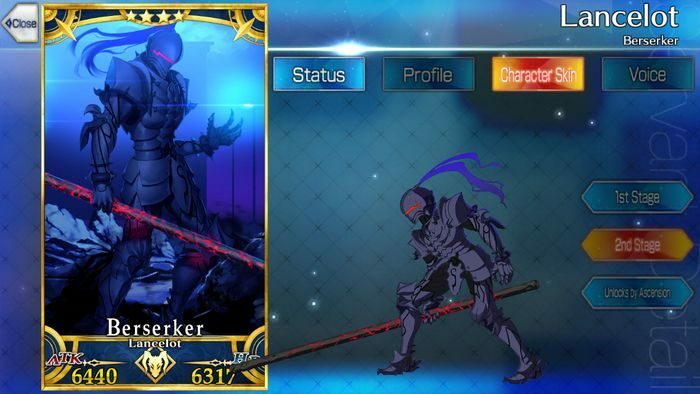 In order to develop Lancelot’s NP effectiveness, The Imaginary Element is another suitable Craft Essence as it allows him to gain an edge even in the early stage of battle. Magic Resistance E Raises unit’s resistance to debuffs by 10%. Mad Enhancement C Heightens damage of unit’s Buster Cards by 6%. Infinite Military Training A+ 3 7 Promotes self’s critical star absorption. Reverse Flow of Mana A 3 7 Self’s NP Gain Up for 1 turn. Heightens self’s Critical Damage Up. Increases self’s attack for 3 turns. Originally a resident of France, he became an orphan and was raised by the lake’s fairy Nimue, thus earning him the title the Knight of the Lake. His desire to examine the capabilities of the King of Britain led him to embark on a journey in order to see the King personally. It was not until he emerged in the face of battle, wielding the King’s sword against the opposition. Eventually, the King recognized his efforts and invited him as a guest-of-honor in Camelot. He is one of the finest swordsmen among the Knights of the Round Table, and his devoted to King Arthur. The Knights enjoyed each other’s company for a time until that fateful day when Sir Tristan left in protest that King Arthur did not make everyone feel welcome, this caused instability to Lancelot and eventually the organization was in a downward spiral. Another story is when he realized that he caused the fall of Camelot by falling in love with the queen. After Gawain’s rejection, this drove him to insanity and remorse before he passed to the next life. As a Heroic Spirit consumed by rage and pouring with insanity, Lancelot is capable of materializing as a Berserker.